Commuting by bicycle or on foot is an economical and environmentally responsible way to simultaneously meet your needs for transportation, physical activity and fun all in one! 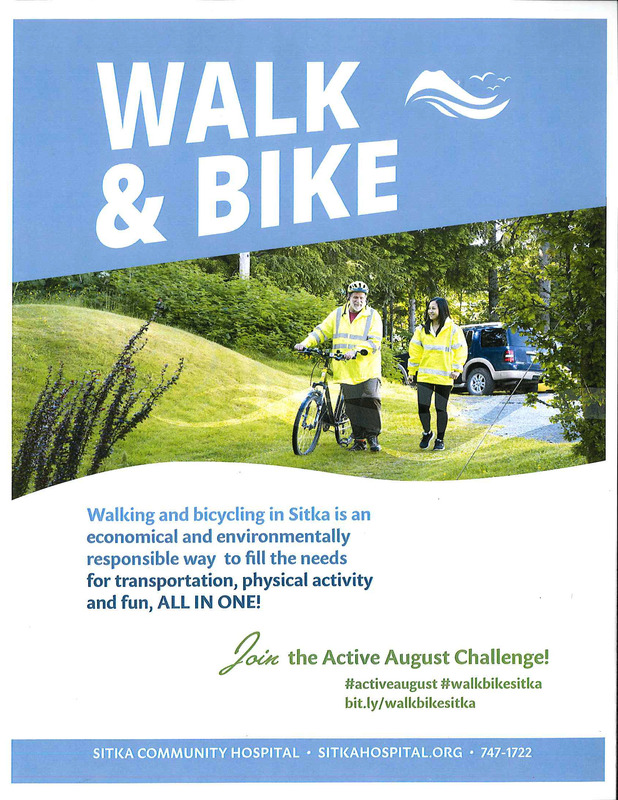 In the month of August, Sitka Community Hospital will hold a summer fitness challenge encouraging Sitka residents to leave the car behind and instead enjoy a walk or bike ride as they do their regular errands and commutes. Sitka residents can start logging trips at any point to be eligible for weekly drawing by completing one or more non-motorized transportation trips a week. On Tuesdays, starting on Aug. 8, one local resident will be selected to win a $100 gift certificate to a local business, the second-place winner will get a free class at the Hames Center. Cyclists or walkers who participate in all four weeks of the challenge will be entered into the grand prize drawing. “Sitka really is a great place to experience on foot or bike and because we are compact, have courteous drivers, and a mild climate it’s possible to combine exercise with basic commuting. Every day lots of people in Sitka are doing just that,” Sitka Community Hospital Director of Health Promotion Doug Osborne said. Participants can enter online at http://bit.ly/walkbikesitka or drop off a hard copy at the Hames Center, Sitka Public Library, Sitka Public Health Center or Oceanside Therapy Center. For more information, visit sitkahospital.org or call 747-0373. 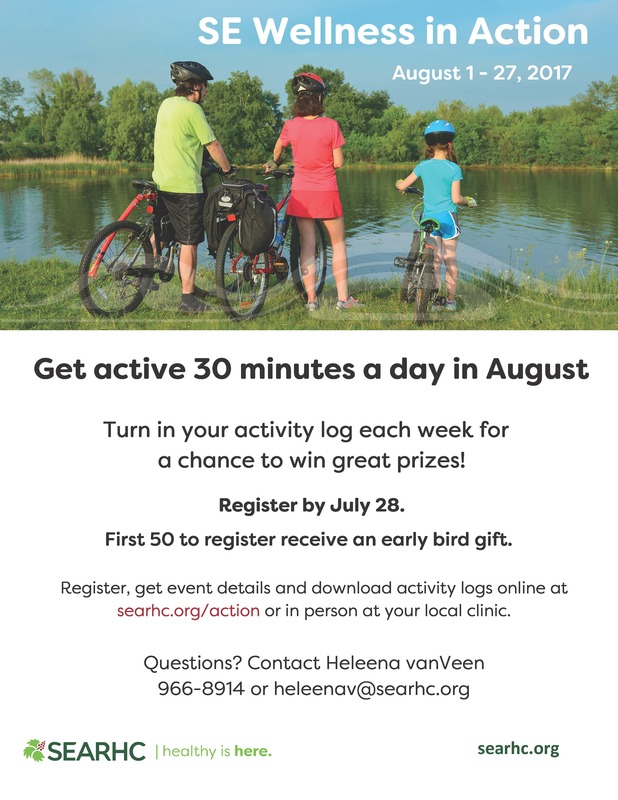 The SouthEast Alaska Regional Health Consortium (SEARHC) is launching the Southeast Wellness in Action fitness program, which takes place from Aug. 1-27 in several communities throughout the region. The goal of the program is for people to get at least 30 minutes of healthy, physical activity each day during August. Participants are encouraged to walk, bike, swim, hike, dance, mow the lawn, play children’s games, garden, gather subsistence food, chop wood, etc., just get moving. There are 1,440 minutes in a day, so make 30 of them active. Participants can register by going to http://www.surveymonkey.com/r/wellness-in-action or contacting their local SEARHC Health Educator (in Sitka, contact Heleena vanVeen at 966-8914 or heleenav@searhc.org) between July 17-28. The program also is available in Juneau, Kake, Klukwan, Klawock/Craig, and Haines (click this link for local contacts and program information). Participants will submit a weekly activity log to their local contact by noon on Monday to be included in weekly drawings for prizes. Riding a bike can be fun, but it’s not so fun when you get a flat tire, your chain gets stretched out or your rear derailleur malfunctions. Do you want to learn how to give your bike a spring tuneup? 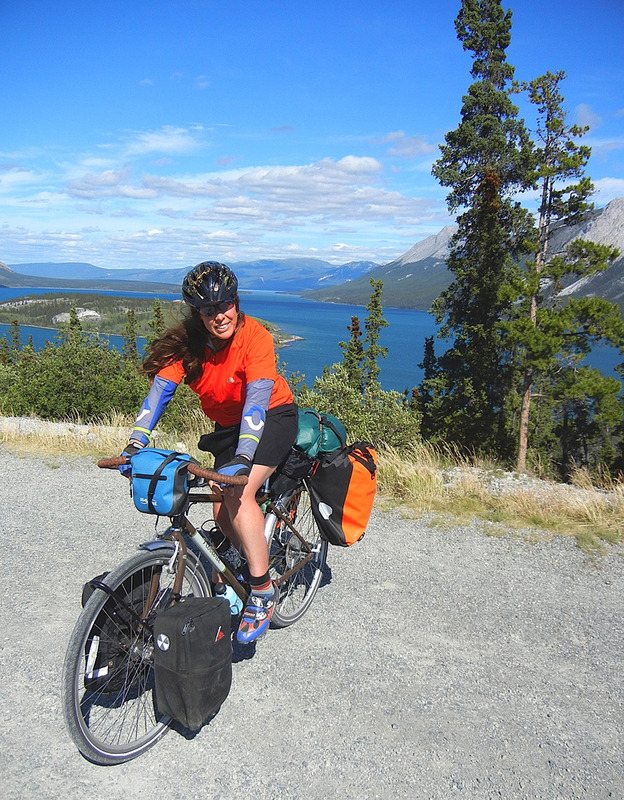 Kathryn Winslow and Laura Kaltenstein will teach a bicycle maintenance class from noon to 4 p.m. on Saturday, March 10, at Room 115 of the University of Alaska Southeast-Sitka Campus. Kathryn and Laura will teach basic bike maintenance, from troubleshooting and adjusting your rear derailleurs to fixing a flat tire and replacing your brake pads. They also will teach you how to tune up your bike. Knowing how to fix your own bike not only will save you money, but it will ensure your bike is safe to ride. Students are encouraged to register in advance for the class (a minimum of five students need to enroll for the class to be taught). Students should bring their bikes, tire irons, a chain gauge, chain lubricant and a bike tool set, if they have them. The class, which is offered through the UAS Office of Continuing Education, Community Education and Professional Development, costs $59 and students can call 747-7762 or 1-800-478-6653, Ext. 7762, or they can go to http://www.uas.alaska.edu/sitka/coed to register. If the weather is nice, there possibly will be a group bike ride after the class.